A blog post that I read this morning written by Landon Whittsett got me thinking. He wrote about the what words we use each day to tell ourselves who we are and how our life is going. It made me stop and think about the meaning and the importance of the rituals that have become a part of our family traditions as our family has gotten ready for Christmas. These rituals, I think, become our unspoken words about what is important to us about Christmas. Yes, there is the wreath hung by the front door and a decorated tree in our living room. And,there are candles in our windows from the First Sunday in Advent through Epiphany. 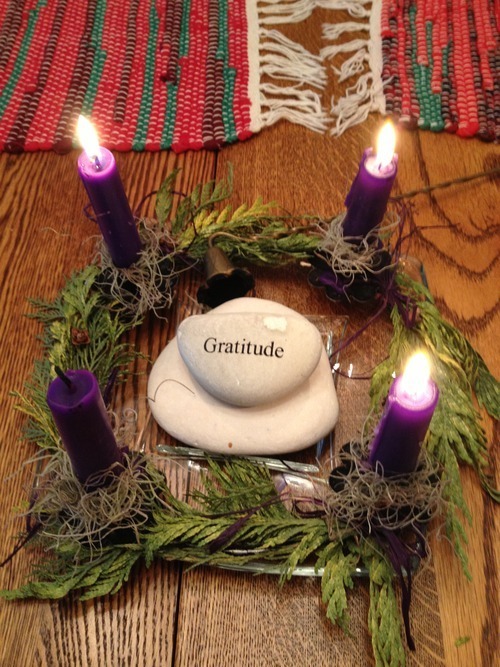 But, it is the Advent wreath on our dining room table that is the most meaningful to me. As we gather for dinner, with whoever is at the table that evening, the candles are lit before we begin our meal. A simple, quiet reminder, often at the end of a busy, sometimes chaotic day, that serve as a reminder that as we move through days with more darkness than light, we are still moving forward towards the promises of Christmas.